So I mentioned the appointment with Liam’s surgeon the other day, but it occurs to me that I’ve never really talked about Liam’s hand on this blog before. And I know that when we got Liam’s diagnosis, I would have LOVED to find a blog or something about macrodactyly. There just really isn’t that much information online about it. And so, I thought I should probably explain a little. 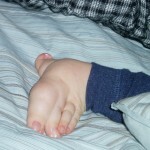 Liam was born with a congenital hand defect called macrodactyly (“big fingers”). On his left hand, the thumb, index and middle fingers are all affected. His index and middle fingers are also joined together which is called syndactyly. When we saw a surgeon back in April, he said that he would separate Liam’s joined fingers, remove as much bulk as possible in the large digits and then he would drill the growth plates in the affected fingers to keep them from getting any longer. The biggest problem with the large fingers though is not the length. Soft tissue builds up around the fingers making them really fat and that’s what makes them less functional. 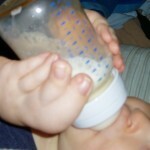 Liam has trouble grabbing things with his big hand because there is just too much bulk. When we saw the same surgeon the other day, he is now saying that he thinks we need to begin by amputating Liam’s index finger (it’s the biggest and bulkiest of the large fingers). While looking for information online about macrodactyly, this children’s hospital in Boston had the most information. According to the description of their program, macrodactyly is something they see every day. So I’ve decided to get their opinion on Liam’s condition as well. If the experts on this condition say that Liam’s index finger has to go, then at least I’ll know I did everything I could. I filled out an online form to request an appointment the other day. I got an email back from them requesting pictures of Liam’s hand and some medical information. The hand specialist there is going to review Liam’s case and then do a phone consult before we come out since we are coming from so far away. I took some pictures of the hand today and I thought I would put them on the website for people to see. Some of you have probably never seen Liam’s hand. Some of you may have wanted to get a closer look, but didn’t want to offend, etc. Or maybe someone has just found out that their baby also has this condition and is searching the entire internet for information like I did so many months ago. In any case, here are the pictures. Feel free to ask questions if you have any. I’m sure this will help tons of people. I still get a lot of people coming to my blog because of my post about Fifth Disease that Corina had. I love that you contacted the hospital in Boston. You’re such a good mommy. Hi: I’m 59 and have been active in music and sports all my life. 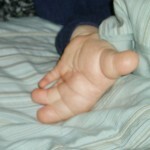 I had two fingers affected at birth: the index and middle; left hand. 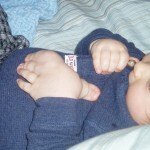 At 6 months old the middle finger was amputated to allow for more dexterity. Of course in 1950, surgery was not nearly as advanced as today. Long story: I’ve been a drummer all my life. I have played on many albums and toured around the world. I am now blessed to have a career in commercial real estate, a wonderful family, and a 7 year old daughter. Though this anomaly may seem tragic, it is not. You learn to conceal and deal. I am just now considering surgery not for cosmetics but to relieve some pain. I have experienced numbness for many years and have been having increasing pain I believe from possible nerve damage to the large finger. Oddly enough I think it is beacuase I am still playing drums a bit too hard! Anyway, be grateful that God has blessed you with a unique son who will find a path that works for him. I loved reading your story! My 3 1/2 year old son had his pointer finger and middle finger amputated when he was 6 months old and 1 year due to macrodactyly. His dad is in a very famous band, he plays bass guitar. My side of the family is all musical as well! Your story is inspirational and I cant wait to tell him when he gets a little older, he definitely has music in his blood and a strong interest in it! I would love to know more about your journey! I am very happy to read all these stories. 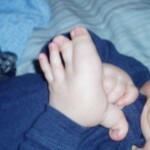 My son is now 1,5 years old and he was born with macrodactyly affecting his middle and index finger on his left hand. The palm of his hand is also very enlarged. 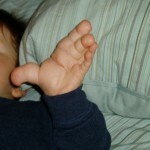 His middle finger was amputated when he was 1 year old, as it was growing very fast and there was really no other option. As a mom, I am very scared about how the macrodactyly will evolve and affect his life. But as a mom, I also know how amazing and special he is, he’s always in a good mood, always in for a laugh and a making jokes. So reading these stories, makes me realise that my precious son will find his way in life. I am convinced that everyone will see how wonderful and full of joy he is, because that’s what he deserves! Gosh….what a relief to find this page! My son has Macrodactyly of the right middle and index finger. He was first diagnosed when he was about 18 months. Had his first surgery at 2 and a half at John Radcliffe childrens hospital in Oxford. I would love to hear other case studies and in which direction the doctors decided to go surgery wise. I am not too sure on the direction they are looking at at the moment. Is it possible to make a group on facebook that we could all chat on. Also be great for my son to feel like he isn’t the only one. A facebook page might be interesting. My daughter is 3 years removed from her last surgery. Only had it on the right middle finger. They removed growth plates 5 years ago to stop it from lengthening and then a couple years after went through a debulking process. It’s still thicker than the rest, but hardly stands out like it did when it almost appeared she had a golf ball attached to her finger. They did say it may grow some more, but weren’t sure. I’d say it has done very little in the past 3 years. If you ever do start up a page, I’d be happy to pass that information along to her and see if she’d like to participate. I’m sure she would. I’ve been thinking about a Facebook page for a long time. There is one for feet already (‘Sole Support’ Macrodactyly) but not specifically for hands. I can easily set it up but I don’t want to be the only admin. We’d probably want it to have a bit of security (e.g. not just anyone can post on the page and we could revoke someone’s permission if we needed) but that means approving group members etc… It shouldn’t be too bad. Is anyone else up for helping? Jade I think I might be near you geographically and I’m an adult with macrodactyly of the hand. Do you want to have a chat / meet up? Thanks for telling about your sons macrodactyly. My daughter also has macrodactyly, but only the middle finger is affected, and not very much. I is always good to have two doctors opinion, in all cases. Wish you good luck with treatment! thank you for putting this on your blog. I have never heard of this before and I am sure many others haven’t either. many prayers and well wishes that all goes well. I have macrodactlyly of the right foot. I am now 59 years old. I would suggest you try to limit the number of surgeries as possible. Each time there is surgery – it creates scar tissue that follow you the rest of your life. I had my first toe resized and pinned at 12 years old. I had the 2nd toe removed when I was 16. This was to reduce the width of my foot. My left foots was a size 7 B my right foot was size9 DD. After surger, I was finally able to wear one size of shoes. But I still suffer from pain from the amputation. My prayers are with you and your little boy. Good thing – it is now 2010 and when this happened to me it was in the 50’s and 60’s. I have the same thing . im 59 would like to hear from you,so glad? I am not alone in this !! Thank you so much for writing about your lovely son Liam. I was born with macrodactyly of the right arm and hand.I have three digits on the hand, the index finger was amputated at approximately the age of 3. 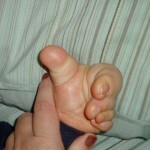 The thumb and small finger are the two which look relatively regular in shape but the thumb is still large. My hand actually looks pretty similar to Liam. As a child with marcodactyly, I knew that my hand looked different but I never felt any different to my peers at school and in my teens. If anything, I got myself involved in all school activities, from the softball team to amateur dramtaics. This is largely thanks to my loving family who never treated me any differently, provided me with support but ensured that I pitched in all my chores the same as every one else! I am now 33 years old, I have a successful career and always live ife to the full thanks to my amazing parents. I thave read all your stories on this board which lead me to confirm my thoughts that macrodactyly is a gift which has provided us with determination, compassion and empathy which makes us special human beings. There are ofcourse those occassions when that is not easy, such as now being I’m at an age where my friends are getting married and having children of their own; which is what I would love but that is when my family and good friends are there to pick me up! With such amazing parents, Liam will be absoluely fine and in fact, will achieve more than most in life. Only you can know what is best for your child. 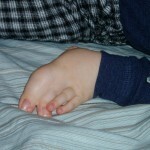 That said, if the decision were up to me and it was MY child, I think I would opt to amputate the whole toe. Given that it’s just one toe that’s affected, your daughter would be just fine with 4 toes on one foot. With the debulking, you’ll most likely need to have surgeries every couple of years to continue debulking which means subjecting your daughter to recovery much more often. And, eventually, the toe might get so large that you’d need to amputate anyway. It would be much better (in my non-expert opinion) to amputate now while she’s still so young and not risk the multiple surgeries. Sorry you’re going through this now. It’s so hard to make these decisions knowing that your child, ultimately, will have to live with whatever you decide. Good luck to your and your family! I am a 39 year old female w. macrodactyly affecting the second digit of left foot. I would not recommend removal of toe. I have been very active since a child and was on a track team for 6 years. I currently run 5 k’s and have completed a 1/2 marathon. I did not have a definition of toe disorder until it was officially diagnosed in 1996. Fascinating! All differences should be worn as a badge of honor!! happy I am to find these stories. I am not alone anymore! I was born with this condition and as a few other stories I have read here I also didn’t really have a name for birthdefect until I started investigating a few years ago online. I have had over the years since infancy 10/12 surgeries to debulk shorten narrow ect. im debating about going for more debulking as it seem to always get fat again. Other than esteem issues..not liking people to see ect its never kept me from any activities except if shoes aren’t correct. Ive been thru everything I have seen posted here my whole life. I had to respond to the other adults. I’m 36 and just in the last year have found a name for my “funny toes” as I’ve always called them. Isn’t it funny that you can have a deformity all your life and think nothing of it. The 2nd two toes on my left foot are affected. Aside from occasional swelling of my foot if I put too much preasure on the ball of the foot (like wearing heels too long) I haven’t had any trouble. That foot is about 2 sizes larger than the other foot, but I just get the larger sized shoe in wider styles and have made it work. The reason I was researching recently was that arthritis seems to have developed in those two toes and my foot has been aching. I’m thinking it may be time to do something now, but I’m sure glad to have been able to wait this long. I’m so glad Liam’s mom posted this. This condition is so rare that the chances of meeting someone like us in pretty slim. It’s nice to know there are others out there. By the way….to the parents dealing with this with their little ones. I know it must seem devestating, but it really will be ok. I was teased a tiny bit as a kid, but my mom told me early that “god made me special”. So whenever someone would ask about my toes I would just say “God made me that way, guess he wanted me special.” Still works with my 5 year old daughter’s friends who ask about it to this day. Your child will be ok – this will not ruin their life!!! That’s awesome, Dani. It’s so nice to hear a story which doesn’t fill my heart with dread. I’ve been so worried that it will really affect her. Did you get much pain from it as a child? My daughter, Brody, grabs her foot sometimes as if it hurts. Thanks again for sharing your story. I’ve been struggling to find real people who have experience with macrodactyly. By the way, I have had two surgeries…one at 5, and the other at 7. One, to shorten toe, and the other to reduce adipose tissue. Hello, my son Jordan was born with macrodactyly of the 3rd digit on his left hand. When he was 11 months old the doctors with Shriner’s Hospital recommended we amputate. It was the hardest decision I have ever made! It is now effecting his index finger. His whole arm is a lot larger. They say it is fatty tissue that is non-vascular. No one seems what to do next. We see a specialist tomorrow–hopefully he will have some answers. I just wanted to say THANK YOU! When my son was born 6 years ago, I could find no information. Thank you for helping to get the word out. Jordan is an amazing little boy. He has no limitations. Liam is a beautiful little boy! Congratulations! They are all a blessing! I know this blog is old, but I am just discovering it and was hoping you could give me a little more information about what ended up happening with your son’s macrodactyly? My son is 22 months old, born with his left pointer and middle finger a lot bigger and fused together, macrodactytly and syndactyly. He had his middle finger amputated at 6 months, and a week ago he had his pointer finger amputated. But his surgeon discovered the nerve in the palm of his hand was VERY large, and not fatty tissue like we previously thought. Also, he mentioned that his arm is getting bigger too. I am so frightened that it could be something wrong in his brain causing this! What answers did you get? Drilling the growth plates made a pretty big difference. The fingers are still growing, but not at an unmanageable rate. He can use his middle finger to grasp things, though he usually opts not to. He’ll need some follow-up work to, at the least, de-bulk some of the tissue on the top of his hand. Thanks for sharing Liams story so far. My son has Macrodactly of the left foot. Left size 4 and right size 2, he has had surgery, performed when he was 10 months old (he is now 9) as his toes were large and overlapped. A section of his foot was removed much like a pie shape to bring together the remaining toes and narrow the foot enough to allow for shoes, skates, sneakers. He is functionally unstoppable and doesn’t complain of any pain but has very dry skin on this foot. He also has Mactrodactly of the left limb, buttock and lypoma (fiberous lumps of tissue) on his back (noticeable). The only issues we are having now are the emotional ones, they get to the age where they want to be cool and the same as their friends, it can be heartbreaking but we are very matter of fact with our son and speak openly about the procedures he has had and why and that he may need more in the future…. I’m getting carried away. As far as Liam goes, only you folks can make the decision, it isn’t an easy one and no matter how old your child is it is hard. I hope Liam is making out OK. I appreciate you posting, it isn’t easy to find a lot of info on this. PS I’ll take the opportunity to let anyone know that if they have a similar situation we would be happy to shoe share as we currently buy two pairs at a time (different sizes) and end up with a brand new pair one shoe size 4 right and one size 2 left – example. Can become expensive so please don’t be shy. My daughter, now 29, has macrodactyly of the right hand. At birth her index and middle finger were affected. She had two surgeries to debulk and stop the growth. Before the age of 3 we discussed and decided to amputate the two fingers and debulk much of the palm. This turned out to be a great decision. The things she was capable of doing afterwards made me feel that the decision was the right one. The problem, however, never really gets completely solved. She has had some additional growth in the other fingers and more debulking type surgeries for the palm. The problem I think lies in the growth of the nerve. They have removed sections of the nerve to relieve carpel tunnel in the wrist and later in the elbow. They have always been concerned with keeping use of the thumb. As she has gotten older she complains of pain and numbness, however, it has not stopped her from having a great life especially after removing the two large fingers. I am so glad that parents now have the internet to talk to each other. I had the same as Karen above, but mine was not too bad and I ended up with static which is the “best” kind you can have if best is the right word. I was lucky enough to find a doc in DC who managed to be a surgeon and artist all in one. Dude is awesome! He basically reconstructed my toe to look like the one on my right foot, but like it should be on my left. LOL! He used lasers so the scars were well hidden on the inside and back of my toe. I wish you all the best! Your little one has a great Mom and he will be fine. Nowadays these surgeons are getting to be like artists with medical training if you find the right one. And with research, growing your own limb isn’t that far off. I am 32 years old with the same condition affecting 2 digits on my left foot. I have had multiple surgeries to shorten and debilk, but still a sight to see. Am hopeful and leary at the same time about choosing which dr to perform surgery? Podiatrist, cosmetic surgeon, plastic surgeon, etc. interested in finding out the nameof the physician in DC who reconstructed your toe. I am 32 years old with the same condition affecting 2 digits on my left foot. I have had multiple surgeries to shorten and debulk, but still a sight to see. Am hopeful and leary at the same time about choosing which dr to perform surgery? Podiatrist, cosmetic surgeon, plastic surgeon, etc? interested in finding out the nameof the physician in DC who reconstructed your toe. My son is two and has had three surgeries thus far. Thank you for sharing your story. As a mom, sometimes you can get weary explaining the condition and progress of my son’s hand. To me he is just a little boy with a build-in hand weapon. (For everyone thinking with the “poor little baby” complex, trust me it’s so not true.) He has his therapy, goes to school,beats his big sisters up like a normal little brother would. How was boston childrens hospital? I am considering the trip. The hospital was great. Liam’s surgeons were amazing. I feel completely comfortable with them and have no doubt that they are experts in their field, they care about my son and will do everything possible to help him. I highly recommend Dr. Labow at Children’s Hospital Boston. How fantastic to read all these stories and to know that we are not the only family facing this situation. My youngest daughter is seven, and has macrodactyly in her left hand on her third and fourth fingers. They are significantly oversized, even though she had the growth platelets removed in 2009. What I struggle with is knowing what to do next. She is strong in character and is now really starting to notice her difference. Already her middle finger is difficult to bend as it is so bulky. We were told by the hand surgeon at great ormond street that our best option was to amputate her fingers before she was one, so that she would grow up without ever having known her big fingers. My husband and I decided that it was not fair for us to make that decision without her consent, and to wait until she was able to join that conversation. Now, when we talk about it, she says to me that she would look stupid with no fingers!!! She deals with it all incredibly well, she is happy, confident and positive, but I still wonder if her life would be easier if we had just amputated when she was small. Who knows what the future will bring, and I am concerned that it is growing faster than the rest of her hand, I guess only really leaving one option for the future. Hi.. My son is affected in the second toe of his right foot (he is nearly three).. We are having it amputated on Thursday (in Oxford, England).. I am dreading it, but hoping that it is for the best and there will be no long term implications like phantom pain, future surgeries.. It hasn’t affected him so far but the rest of his foot is going out of shape.. Wish me (or rather him) luck! I am 29 years old and am one of the “lucky” ones that has the static form of macrodactyly. It effects the my first two toes on my right foot, and the surrounding area. I actually just found out about 7 years ago what it was that I had. My mom didn’t know what it was, just that they amputated the first digit of my toe and fused together the remaining two digits to stop it from growing any longer. I have had a total of 3 surgeries, my initial one and two more about 10 years apart to de-bulk the surrounding tissue. This is the first time I have found so many stories of people who also have this condition. I wish you all the best of luck. @Emily. I hope the operation has gone well for you. Let us know. We are off to the doctors next week for another referral so we can see what the current situation and options are. We think that our daughter has the progressive type, so amputation maybe our best path. Hi, glad to know the surgery went off well. of liam’s fingers after his surgery. Has the growth stopped? as well as liam’s progress after the surgery. I am currently fifty one years old and have three surgeries on the pinky of my left hand due to macrodactyly. The first surgery when I was fifteen was over a hundred stitches where they removed one tumorous nerve and flesh tissue. I later had another at age nineteen where they removed more tissue. My last surgery at age 35, they reset the bone so I could at form a fist and since then I have finally been able to learn to play bass guitar. I have found that periodically I need cordzone(sp?) injections to relieve the pain and tension in my hand that leads to my effected pinky. Hi, my son was finally diagnosed on Tuesday with Macrodactyly, he turned 1 a few weeks ago. Just curious what the outcome was for your son Liam. We are also seeing a specialist in Boston at Childrens (luckily we are only 3 hours away from them). Does Liam have any pain associated with this? I have a ton of questions and would love to talk to someone who has gone through this, thank you! We haven’t noticed any lingering pain after the main bone work was completed. He uses the hand extensively and sometimes seems to favor it. This might cause some problems with writing and other dominant hand tasks down the road. Since the condition is so rare and each case manifests in slightly different ways, it’s kind of hard to say how things will happen. We’ve been fortunate that post-surgery, there doesn’t appear to be any additional growth. My daughter also has Macrodactly, hers is in the right index and middle finger. We have been on this journey since 1998, when she had her first surgery at age 3. I noticed her fingers being longer the day she was born, but her pediatrican said it was nothing, and they would balance out. It wasn’t until she was three and the functionality was being effected that he final took an x-ray. After looking he was surprised by the bone deformities and sent us to an orthopedic doctor. I knew somehting was very unique when the the orthopedic got the surgeon to drive to his office, while we waited. It was the first time I didn’t have to wait for an appointment. We were lucky that we lived in a city with an experienced board certified pediatric hand surgeon. My daughter has had four surgeries to debulk and destroy growth plates. She is now 17 and fully grown. The surgeon did a great job and th elength of her fingers are dead on to her left hand, since the last growth was 7 years ago, I would say she did great. We just scheudled the first of what will be four additonal surgeries ot debulk, and add additoanl legiments the joints to increase funcitonality. The surgeons hope this will take her into her thirties or fourties when they are prediciting her needing her bones fused together. Claire has worked with an OT for years as well. She is hoping the surgies will be done before she leaves for college next year. I am glad we didn’t amputate, though his index finger is still WAY bigger than the other fingers and one day it may come to that. If your niece doesn’t have insurance, I would suggest looking into Shriner’s Hospital. They are a non-profit children’s hospital. If your niece’s application is approved, the surgeries would be at no cost. Really the only consideration that had to be made for us at Boston Children’s since we are out of state, is that the surgeon did a phone consultation with us and we sent him pictures and x-rays of our son’s hand instead of traveling out there for the initial consultation. We did not go out to Boston until we had a surgery date scheduled. Liam didn’t have his first surgery until 13 months. It’s too dangerous for infants to be put under until they get old/big enough, so I can see why your surgeon wouldn’t want to operate just yet. It was hard for us to wait too, but kids are extremely adaptable while they’re young. The sad truth about macrodactyly is that it is so rare that most hospitals don’t even have a doctor that knows what it is. We went to Children’s Hospital Boston specifically because their website contained a lot of information about the condition and we felt confident that despite an overall lack of knowledge within the industry, they’d be best-suited to handle his case. They see a lot of patients from outside the US because of this. I don’t know enough about NHS to know if they’d cover going internationally, so you may end up covering the cost yourself. That said, CHB has a number of charity programs to help cover costs and is usually willing to negotiate the final bill for anyone paying out-of-pocket. They also have excellent patient family housing within walking distance of the hospital for extraordinarily low rates and volunteers will often bring in food for at least a few dinners a week. CatC – don’t be terrified. I’m not Lauren so I’m speaking a bit out of turn, but I have macrodactyly of my 2nd toe too. I’m 37 years old and I’ve never had any surgeries or really any issues except having to buy a size larger shoes and a tiny bit of teasing in high school (which if it hadn’t been about my toes I’m sure would have been about my hair or face or who knows what – that’s just how kids are :). I only found out a few months ago what this was even called. I’m fortuntate that I have the static form of macrodactyly so my toe grew larger and longer than my other toes, but stopped when I stopped growing. I played sports in high school and now I compete in fitness competitions. Its wonderful that you are looking into options for care for your daughter – talk to Drs. and do what you think is best. For me, my parents decided that this issue wasn’t slowing me down a bit and it was best to just leave it alone and see what happened. I hope that’s the answer for your daughter too, but even if it’s not and she needs surgery she will be ok!!!! My mom always told me that god made me special, so even to this day when someone asks about my toes I just say – God made me that way, guess he thought I should be special – and laugh. Defuses any embarasment – theirs or mine and brings things into perspective. I wish you and your daughter the best!!! Thanks, Dani. I wouldn’t be embarrassed myself and I hope she won’t either. We even gave her toe a name haha. It’s more the pain aspect I worry about. So far it has been static but I know that could change as it is still early days. Do you experience much pain? She grabs her foot quite often and I wonder if it hurts or if she has just stubbed it. Thanks again for your reply. It is nice to speak to people who have first hand experience and it makes me much more hopeful that all will be ok. We have a genetics appointment next week to find out if the macrodactyly is a symptom of another illness so fingers crossed this goes well. Sorry CatC – I posted and then didn’t check back. I don’t recall experiencing pain as a child. With the toes being longer they are easy to stub and at some point the joints in mind stopped bending (I think b/c of arthritis). Once that happened in my 20s I did notice that shoes that put me on my toes for long periods of time (heals or snowboard boots tended to be the worst culprits). Now (I’m 39) the arthritis has gotten worse (I work out/run 6 days a week so I bang on my feet a lot) and any shoe that constricts my foot too much can cause it to swell which does lead to pain. I’m actually just now considering trying to find a specialist to look at doing some kind of surgery to help with the arthritis. I’m guessing my now your daughter can talk so hopefully she’s now able to tell you if it does or doesn’t hurt. I’m sure everyone is different, but for me it was a nonissue until just the last couple years (and I truly think that’s more a product of my lifestyle than typical of the disorder). Thank you for continuing to answer questions on this blog, I always keep up with it when a new comment appears. We head to Boston again in 2 weeks to have our son re-evaluated. We are pretty sure at this point that he has bi-lateral macrodactyly in his index fingers and we get get the official diagnosis when we go back to Boston. Its tough because it is so rare and no 2 cases are alike, but I appreciate hearing about your experience. Thank you. My wife found the blog and I tracked it down after she showed me. Our daughter was born almost 14 years ago with a slightly enlarged middle digit on the right hand. Thsi grew as she did, well, faster than she did. At about 9 years old we had her growth plates removed to stop the bone from lengthening. This seemed to work, although like one other member commented the bones under the tissue was also enlarged. Just a few weeks ago we had the debulking procedure done. The thought/hope is that the tissue growth and any bone growth would subside since she was effectively done growng (based on the x-rays) … we haven’t seen it fully healed, but the length looks great. Will still be thicker and the procedure has been a painful and challenging one for her to work through, but we’re on the mend. Thank you all for sharing, it’s good to know that we’re in ths one together. Just came across this blog. My nine yr old has static version impacting only the 2nd toe. Just started bothering him this year ( emotionally and physically). Looking at options for him. Thank you so much for sharing! Just an update on my daughter, I posted back in September of 2012 about a week or so out from her surgery. It has been just about 6 months now and things look great. The finger’s length is right in line with the others, mostly due to the surgery she had years ago (5!) to remove the growth plates and stop it from lengthening. The finger still grew longer due to the tissue and actual bone growth, but the surgery 6 months ago removed (debulked) the tissue and shaved the bone down. They even reduced the size of the nail bed. A few weeks after the finger was quite swollen, but within a month or so the scab like tissues came off and after a few months swelling went down and now it looks good. We did notice some scar tissue protruding as the swelling went down, but that’s not bad considering the size is more in line wiht the other digits. She is a freshman in high school now and I hear you (Jen) about the emotional impact it can start to have. She always had a great attitude about it, but sometimes being singled out for something like that can wear on them. No, we’re in the US. We went to Boston Children’s Hospital since they have specialization in the procedure. They get a lot of international patients because of how great the care is. I’m sure it’d be a real chore to pull off, but it would be worth considering. I have macrodactyly of the hand, I’ve had several surgeries and been seen in several UK hospitals. I’m now in my early thirties with a very functional hand. The hosps that were particularly good were Great Ormond Sreet, Royal National Orthopaedic hospital (London), Royal Orthopaedic Hospital (Birmingham). These were either specialist children’s centres or centres that were really good with plastic surgery for things to do with bones. Macrodactyly is pretty rare so it’s really worth asking about for a consultant who’s got some experience – I followed one of my consultants through several different hospitals. In my experience treating young worked emotionally even though I had several surgeries. Good luck. Hi – thanks for that. Obviously, especially with a child you want to do everything you can to get a good end result – as quickly as poss. Our current consultant is a Mrs Burke at Leeds. We have also seen a Mr Bainbridge in Derby. Any information and advice you can pass on would be really appreciated. Thanks again. We haven’t done any amputation. Liam has adapted to having some fingers larger than the others and we’ve been primarily focused on his autism issues. I am suffering with macrodactyly also but in the foot. Since i was born. Cannot find any answers in the UK. Am open to suggestions. My condition is in my foot so rarer than others. If anyone can help me please email me. Children’s Hospital Boston is part of Harvard Medical. I’d imagine that other Harvard-affiliated hospitals in Boston would have the same expertise that they do. Not that it would be easy to cross the Atlantic for treatment or anything. My daughter was born in 1997 and also has macrodactyly of her left foot. She has had numerous surgeries at Children’s Hospital in Boston. Dr James Kasser, Chief Surgeon has treated her since she was two. We’re fortunate to live within a days travel. The staff there are fabulous. Perhaps they could make a recommendation as to specialists in the UK? Hi Justin, my daughter also has macrodactyly affecting her foot. We are also in the UK so I’d love to hear from you. Can I ask how Liam’s surgery went? My son is 2 and has static macrodactyly affecting his right index and middle finger as well as a portion if his palm he often complains about it hurting. I am in the process of getting all of his info to Boston Children’s Hospital. I wanted to wait till he was older for surgery but I don’t want him to be in pain. I have a 10 year old daughter who was born with Macrodactyly on 3 toes on her left foot (toes 3-5). This has caused her foot to be a very wide foot. We started searching for Macrodactyly experts at 6 months old (back in 2005), and there were very few around at that time. We ended up at Childrens Hospital in Washington DC and have been there ever since. At age 4, we decided to do a ray resection on her middle toe. It was the largest toe and was starting to interfere with her 2-normal toes (the big toe and the second toe). The surgeon removed the toe and used ligaments in her foot to tie/wrap the foot to cause the space where her toe was removed to close up and have her toes pull together to normalize and create a slightly narrower foot. The surgery was hugely successful, and she was able to move forward playing every sport under the sun with no issues or pain whatsoever. She was still only able to fit into a shoe that was two to three sizes larger than her right foot, and in an XXW, which means sneakers and boots only. This disappoints her because she wants to badly to wear flat ballet shoes or heals but she just can’t fit into them. Fast forward to today, she is a happy energetic 10 year old girl. We are now considering another ray resection on her 4th toe for the same reasons. The toe has grown and her foot is again extremely wide. Debulking will most likely not do much for her, but a ray resection will once again remove the large intrusive toe in addition to removing the additional cartilage between her toes that debulking will not handle. The surgeon will wrap her foot using ligaments again in hopes of narrowing out her foot. Before we make this next step I also plan to consult with Childrens in Boston as well. At the beginning of this long road, back in 2005, there was very little information on the WEB to be found about Macrodactyly, and even fewer communities talking about it if any. It is comforting to see other similar stories out there. I would like to say for those just beginning their journey, be at peace. My daughter is happy, healthy, confident, kind and athletic. Macrodactyly has not stopped her from doing anything! While she does get disappointed and sometimes frustrated about the limitations in shoes, she moves on and lives her life to it’s fullest. My daughter also was also born with macrodactyly of three toes on her left foot. She was treated by Dr. Kasser at Childrens in Boston. He and the hospital are fantastic! It took six surgeries starting at age 3 but she is now 18 and done treatment. Her end goal (which was met) was to wear heels and although that may sound trivial to other parents on this site, I can tell you that it is incredibly important to a teenaged girl. Feel free to contact me directly at kbanderson@yahoo.com for more details. I am a 28 year old teacher from Montreal, Canada. I also have a Macrodactyly; left foot, second digit and bottom. I have had 18 surgeries to correct my foot- debulking, growth plates, pinning, amputations etc. I have been followed by the same surgeon since birth and he has never let me down! I think of him now as a miracle worker. My shoe size is the same, I have minimal scarring and most of the time the deformity goes unnoticed! As a child I had a hard time with my peers questioning me, especially growing up as a swimmer and lifeguard. I would often hide my foot under the other. I would also, at times make up crazy stories about how I got all my scars (shark bite or lab accident). With support from my parents and eventually becoming comfortable with who I was, I was able to be proud of all the operations I had gone through. Now I wear flip-flops, let my boyfriend rub both feet and I even go for pedicures! My parents encouraged me to try sports, go on trips, join clubs etc. So, all this to say, I have never felt limited in anything I do and I know that your son will go on to live a fulfilled life! I am wishing your family the best of luck with all your treatments! Next story A quick note to let you all know how much I rule before I pass out.